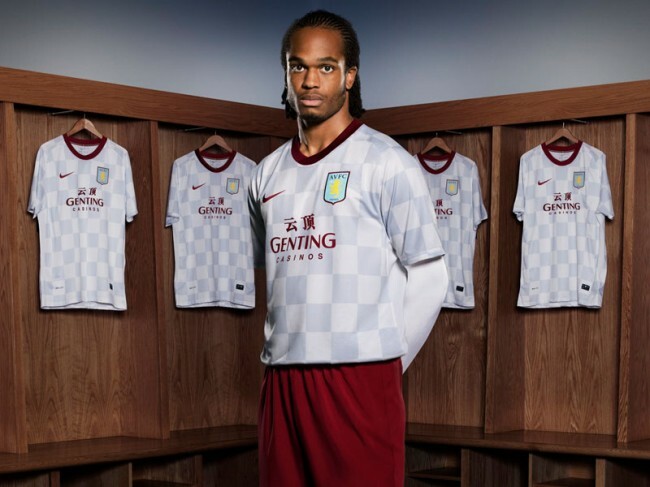 For what it’s worth, Villa’s new strip is not going to be featuring particularly prominently on Pies’ ‘wanted list’ – it’s bit of a hotch-potch by our way of reckoning. Any thoughts folks and folkettes? Agbonlahor looks very confused in these photos, guess he doesnt know what those chinese letters mean! No way! The chinese letters look cool. I think it’s a really nice kit. Think it looks pretty smart. @ Mark Bosnich Agbonlahor looks perpetually confused! Kit is horrific mind. Classy. Reminds me of the kits I’d make on PES! 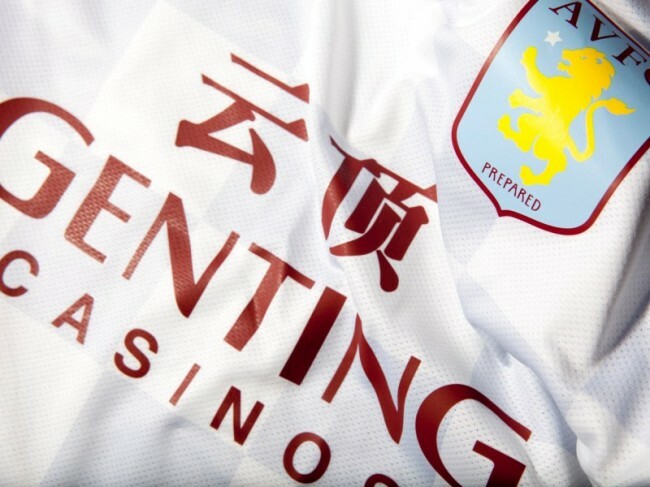 Just because it has Mandarin characters on the shirt, it does not make Genting a Chinese company – they are malaysian. They also operate casino’s all over the world and operate some of the biggest UK casino brands. Would look better if it was just the characters and not the writing in my opinion – but a fine shirt none the less. I don’t mind the checkerboard look, its the sponsors lettering that ruins it! Looks like a some sort of “tramp stamp” you find on the lower backs of easy birds! It means cloud peak, or something like that. @Rich So… Chinese words = tramp stamp? What logic is that? I think the Chinese gives it an exotic and awesome look. In the first pictures I think Gaby’s thinking about getting the Chinese/Mandarin letter’s tattooed on him if this season goes well! Genting is actually owned by a man from Birmingham. He is a Villa fan as well. As explained by No. 8 Charlie, Genting’s a Malaysian company running a huge casino operation. More to the point, they’ve recently opened Resorts World in Singapore and are currently raking in the mega moolah (http://www.straitstimes.com/BreakingNews/Singapore/Story/STIStory_677123.html). And their target market is the nouveau mega rich Chinese flocking. Hence, with the popularity of EPL in China, it only makes sense to sponsor an EPL team and plaster their co name in Chinese characters all over the players torso. My question is: why did they pick Arse-ton Villa?